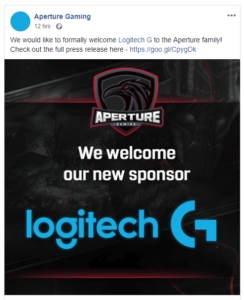 Yesterday South African MGO Aperture Gaming announced their new partnership with Logitech G, a brand of Logitech. This partnership is particularly aimed at directly sponsoring ApG FE (ApG’s female CS:GO team), thus empowering local female players in the esports scene. Theuns Louw said, “Logitech G will provide the team with the latest devices and peripherals from the brand’s sought-after G-Gear range, as well as financial support to cover the players’ expenses when attending events – often one of the biggest barriers to entry for local gamers.” This is a particularly valid point, with teams often having to pay around R20,000 to send a team to a LAN final. “Logitech’s support and financial contribution is a huge deal for us and our players, as our players would not be able to compete without it,” he added. This is exactly the sort of positive outcome many had hoped to see after the hugely successful Valkyrie CS:GO tournaments Mettlestate operates. With this support I hope that ApG FE progresses to even greater heights to eventually challenge the top CS:GO teams in the country. What is next for this new partnership? You’ll be able to meet the players from ApG FE when they join up with Logitech at Comic Con Africa this weekend (14 to 16 September 2018). There will be signed goodies up for grabs, along with other prizes. Make sure you go say hello.